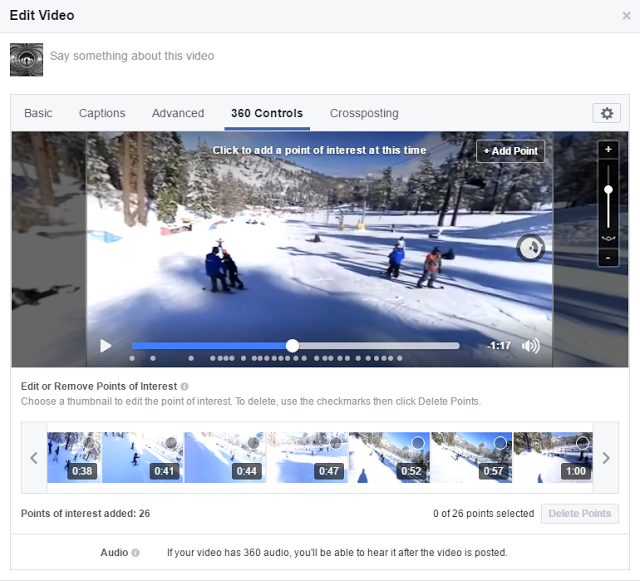 A couple of weeks ago, Facebook launched new controls for posting and editing 360 videos, including a revamped Guide feature. Here’s a demonstration of its advantages and how to use it. First, I wanted to show the benefit of using the Guide feature. I recently took some 360 videos while skiing with my family. I used the Keymission 360 on a selfie stick handheld without any gimbal. As any skiier knows, you need to make S-turns as you go down the slope. As you can see, although the Guided video is nowhere as good as having a gimbal, it’s much easier to watch than the same video without the Guide. You can edit or delete points using the thumbnails below the video, which shows each Guide point that you added. BTW you can also adjust the field of view on the right side. When there’s lots of movement, I personally find it better to use a wider field of view. When you’re done, just click on Save. That’s it. The change will be applied right away. No need to re-upload the video. Hubblo VR’s first 4K 3D 360 video sample posted!